Montgomery Canal Partnership – Canal restoration a “visionary project” that must be completed, says AM | News by Wales Express News, People Before Profit! Mid and West Wales AM Neil Hamilton has described plans to restore the Montgomery Canal as “visionary” and has pledged his support to get the project completed. 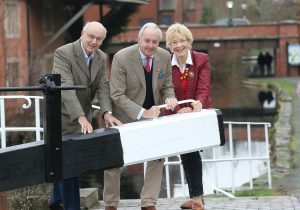 Pictured by the Montgomeryshire Canal at Welshpool is from left, John Dodwell (Chairman of the Montgomeryshire Canal Partnership) Neil Hamilton and Christine Hamilton. Mr Hamilton, who represents the United Kingdom Independence Party in the National Assembly for Wales, made the comments after meeting John Dodwell, Montgomery Canal Partnership chair and Michael Limbrey, Montgomery Waterway Restoration Trust chair, in Welshpool on Friday. Previous articleApprenticeship Awards Cymru 2018 – Wrexham aerospace company flying high after national award.